The private shelter “Moi Khvostiki” is located in the village of Vasyurinskaya, Krasnodar Region. The shelter was founded in 2007. It is currently a home to 83 pets: 45 dogs and 38 cats. All the pets are different: different ages, sizes, breeds and different fates. Some of the shelter’s pets are disabled. These pets need life-long care to be provided by the shelter. Other pets are still hoping to find a new home. The organization is strictly against euthanasia. At this moment, “Khvostiki” is unable to qualitatively equip its territory – the dogs live in booths in the open air, and the cats live in the house of the shelter’s hostess. 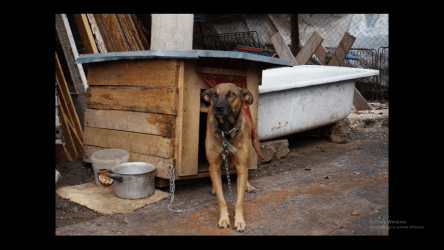 The organization strives to set up live broadcasts to attract additional help from people around the world and tell about the shelter and its pets. The hostess of the shelter is the only person to take care of the pets. She cleans the territory, keeps everything in order, feeds and socializes the pets! A volunteer movement from Krasnodar, “Chance for Life” greatly supports the shelter. These are volunteers without whom the shelter’s activity would become impossible. The volunteers of this movement are willing to improve the shelter “Moi Khvostiki” and later on other shelters in Krasnodar Region. “Chance for Life” provides assistance in sterilizing the pets, obtaining the necessary goods for the pets, and, most importantly, finding a new home for them! The organization “Moi Khvostiki” aims at reaching the level of European shelters and improving the life quality of the shelter’s inhabitants. All the pets are sterilized and put in order so that they can find a new home as soon as possible. Since the day of its foundation, the shelter has housed more than 1000 dogs and cats. The shelter constantly needs the help of volunteers in walking and sterilizing the cats, as well as finding a new home for them. The shelter fully depends on the donations of kind people. The organization maintains strict accounting and control over the funds spent. Additional video and photo materials are provided.